As the Un-carrier™, it’s T-Mobile’s nature to expose and eradicate broken wireless industry norms—those painful practices Americans have endured for so long that we’ve lost sight of how nonsensical and needless they truly are. Like being forced to wait all that time to upgrade to a new phone. Or being charged 15x more for your data when you leave the country. Or having unused data you’ve purchased confiscated each month. T-Mobile’s relegated all that to the trash can of history. And now, you can add the carriers’ old-school coverage maps to that list. T-Mobile’s Next-Gen Network Map− the industry’s first and only crowdsourced, customer-verified network coverage map − right here at t-mobile.com/coverage.html. For years, every carrier has produced their network map in the same way, based on ‘predictive coverage estimations.’ The problem is that these maps are exactly that—best estimates. But for some time now, there have been far more advanced methods and technologies available to produce far more accurate coverage maps—based on the actual experience of real customers, like you and your family. Still, the carriers have stubbornly held on to their old maps based on imperfect methods and dated technologies. But we are changing all that! T-Mobile’s new Next-Gen Network Map reflects near real-time customer experiences on our network—based on more than 200 million actual customer usage data points every day. On top of that − to validate and augment our own collected data − our new map also incorporates additional customer usage data from trusted third-party sources, including Inrix and others. 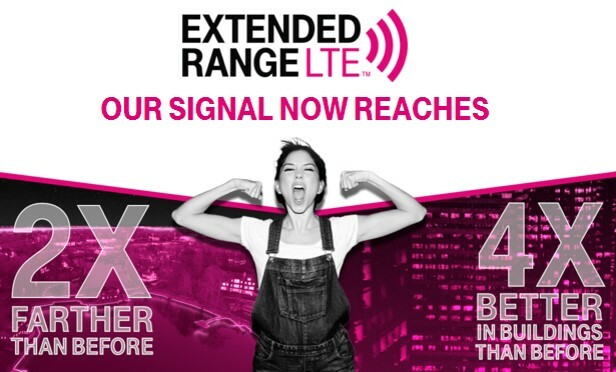 As T-Mobile continues to rapidly enhance and expand their 4G LTE coverage to reach 300 million Americans this year, their new Next-Gen coverage map will also continue to evolve—based on billions of data points provided by real customers’ real-life network experiences. Because, at the end of the day, your experience with T-Mobile’s network is what it’s all about. Over the past few years T-Mobile has been emerging in the metro markets with a mission to reinvent the industry. Their “UnCarrier” message was somewhat new to industry at a time when contracts were the norm for retail customers to get “free” phones, or significant reductions on phone pricing in exchange for paying a higher monthly rate on their phone plans. In Q4 of 2015, T-Mobile unveiled a new coverage map for their 4G LTE network that dramatically improved their network coverage Nationwide. So much so that AT&T and Verizon, the big two for mobile phone business plans, should be extremely concerned about how they will impact their business phone customer base. T-Mobile’s Business Phone Rates are incredibly attractive, and can save companies as much as 50% or more on their mobile phone business plans they’ve been paying to AT&T and Verizon for many years. Whether you have one phone or multiple, T-Mobile has some of the best business rate plans for mobile devices in the industry. 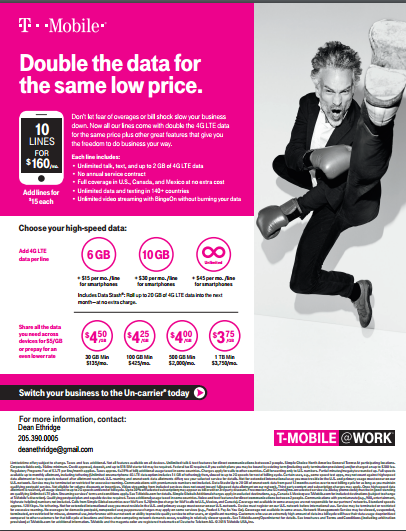 The T-Mobile business rate plans are also simple to understand. For example, you can get 10 Phones for employees, each with 2GB of 4G LTE data included, unlimited talk and text, unlimited video streaming on the top video platforms (Netflix, HBO, Crackle, etc) using their Bingeon service, internationally text and calling, and much more for only $160! If you need 11 or more phones, the rate is only $15 per line. If you need to add more data for certain individual users, you can add it to that individual plan. If you want to pool the data across all the users, T-Mobile has a cool feature that allows you to avoid massive overage data overcharges by only paying the amount you sign up for per GB overage. The overage rates start at $4.50 per GB on overage which is much different than AT&T and Verizon overage policies that charge per MB. If you go over the allotted plan you picked, your rate goes down according the next available tier as you can see below. As you can see, the T-Mobile Business plans are extremely competitive and a refreshing alternative to the contracts, rate plans and stuffy customer service mobile phone customers have grown to expect from AT&T and Verizon. T-Mobile has been the red headed step child in the industry for the past few years as they grew their network, and established their business platforms. Not any longer. T-Mobile is poised to be a major player in mobile phone business world with their new coverage build out and their attractive, sensible business rate plans. We’d love to help you determine what your business needs in regards to types of phones, the proper rate plan you need, mobile hot spot devices and other applications such as GPS tracking or employee management software available in the industry. Now T-Mobile extends your coverage beyond the borders at no extra charge. Get 4G LTE data in Mexico and Canada just like in the US. And keep in touch with unlimited calls and texts. See some of the markets where 4G LTE is currently available below.